Buzz Words: Ride, Ricardo, Ride! Ricardo loved to ride his bike. 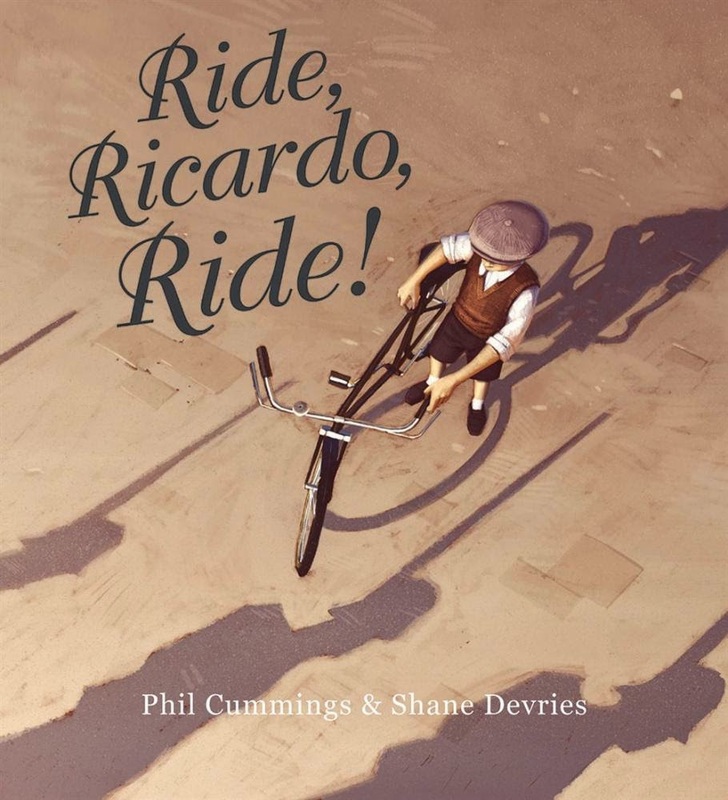 His ‘silver handlebars sparkled like fresh snow in sunshine’ while his father watched on, clapping, saying, "Ride, Ricardo, ride!" Then one day the shadows came. And life was never the same again. This stunning picture book, set in a war-torn European village, engages all the senses. The smell of the wildflowers, feel of the wind and the quiet stillness which transforms into the endless drone of marching military boots. The text evokes imagery while the illustrations add substance to the story. Every sturdy glossy page glows. As the ‘shadows’ mar everyday living, this glow adds eeriness, where previously it made everything shine. The use of the shadows and what they represent is very effective too. The line ‘In the darkest of one of these nights, Ricardo's father went out and was lost to the shadows’ takes the breath away. This is picture book writing at its best. There are not many words, but each is vital and creates emotion and pictures. The illustrations are just as spectacular, images and colour filling every page. Ride, Ricardo, Ride! could be read to preschool-aged children, neither the war nor soldiers are mentioned directly. It is a beautifully uplifting story, but be aware of the menace of the shadows, the war-torn streets and the implied death of Ricardo's father. The ending, with Ricardo putting his bike back together, piece by piece, as many would their lives after the war, is wonderful. The text, illustrations and layout all combine together to create a beautifully appealing picture book. It would be a great addition to any bookshelf and one I would highly recommend to anyone wanting a story about the war and its impact for younger children.